Yeah, I won't lie - this sandwich is as good as it sounds. It's your everyday breakfast of dreams. I don't eat breakfast every morning myself, however, this sandwich is so incredible it makes me want to eat breakfast every morning. This is a classic flavor combination. You get all the salt in the world from the fried chicken (a vegan version in this case) paired with waffles deliciously drenched in sweet, sweet maple syrup. What more could you ask for in a breakfast? Although I don't eat breakfast everyday, when I do, I ensure I do it right. Which means I need all waffles, pancakes, [vegan] bacon, fruits, and toast I can get my hands on. This sandwich somehow manages to fulfill all those needs. 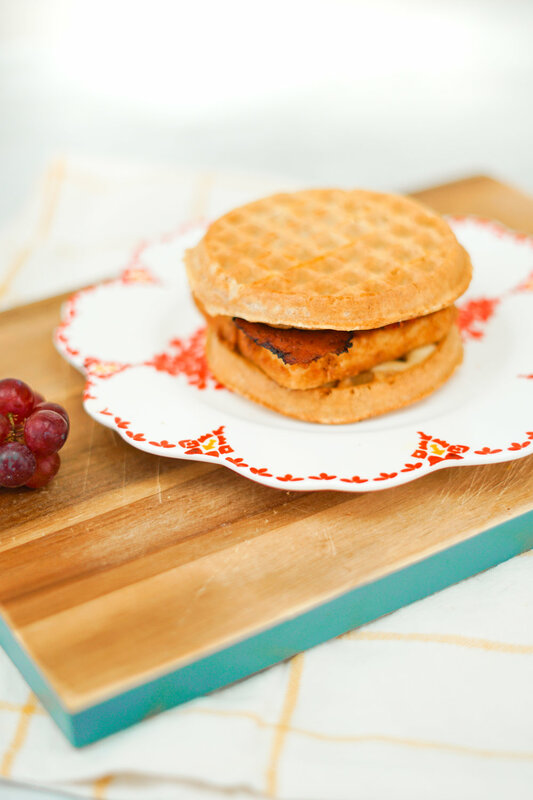 To make things extra easy, I recommend you use freezer waffles. Less clean up and a quicker end result! Plus one less kitchen device to purchase if you don't have a waffle maker (like me). If you wanted to kick it up an extra notch, a hasbrown patty would fit in with the group just fine. I personally am satisfied with the waffle-fried tofu-bacon trio but potatoes are an important part of the classic American breakfast. I’ve also mentioned how important sauces/dips are when it comes to completing a meal. This was actually the hardest part of this sandwich - sriracha or Dijon mustard in the maple syrup? I wanted something to balance out the sweet and salty with a kick. But do I use classic spice or something more surprising? I decided to go with sriracha but I leave the final decision up to the chef. Probably the best part about this entire creation is the vegan bacon. Sweet Earth makes the best vegan bacon you'll ever buy. I wasn't a big bacon eater before going vegan, but it's nice to still have the option now. The following instructions and quantities are for one sandwich. Combine all your dry ingredients into a small, shallow bowl, whisking together. Pour your nondairy milk into a separate shallow bowl. Take your 2"x2" tofu square and first place it into the milk bowl, evenly coating. Then, transfer the tofu square to the dry mix bowl, coating it thoroughly. If you want your "chicken" to be extra crispy, repeat the process one more time for a double battered tofu. Over medium heat in a small sauce pan, add your 3 tbsp of canola oil. This may seem like a lot, but this is how to will get the tofu to fry like chicken. Carefully place the battered tofu into the pan, flipping every minute or until the edges of the tofu are turning golden. In a separate small pan, cook your bacon slices over low heat. These should only need one minute on each side, so keep and eye on them, and remove once they appear crispy. While the tofu fries, place your waffles in the toaster to become crispy and toasted. 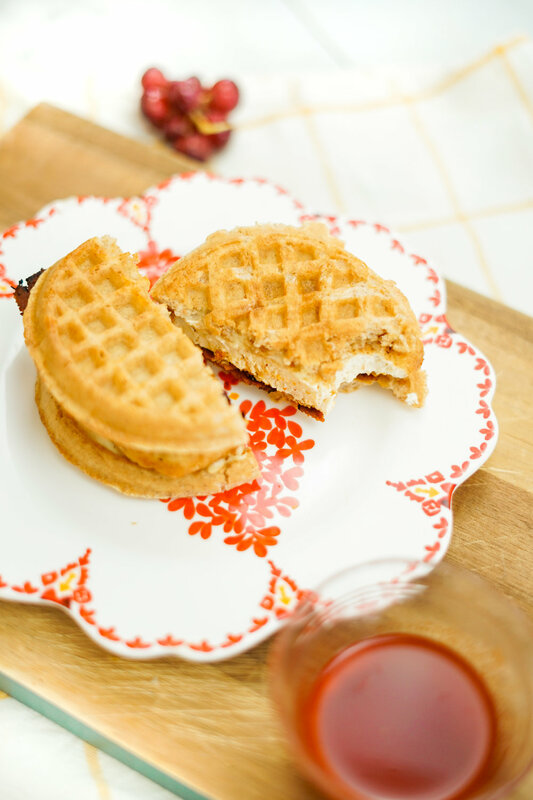 Once the waffles are done toasting, remove them from the toaster and spread a generous layer of vegan butter on the sides that will be facing the inside of the sandwich. Option to also brush a layer of maple syrup here. Check on the tofu to make sure it isn't burning. Once all sides are golden brown, remove the square from the pan and place on a butter waffle, followed by the bacon slices and cheese. Place the second waffle on top of the pile. 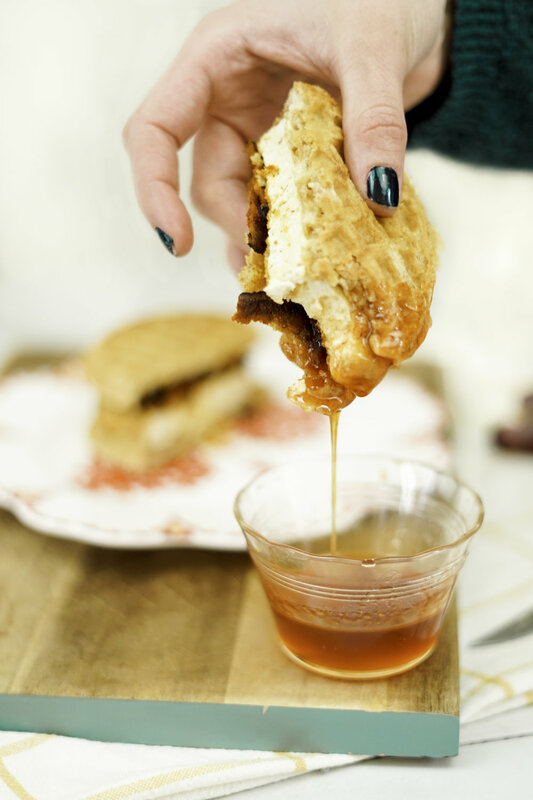 Dip into your sriracha/dijon maple syrup and enjoy!